The seacoast of Washington stretches some 250 miles, from Point Wilson at the east end of the Strait of Juan de Fuca to Cape Flattery at the west end, then south along the Pacific Ocean to the Columbia River and the state of Oregon. The coast, including more than 800 offshore islands and rocky outcroppings, offers a variety of habitats and exciting birding opportunities in four rather different subregions: the interior of the Olympic Peninsula, the North Olympic Coast, the Outer Olympic Coast, and the South Coast. The whole area has a maritime climate. Winters are wet and relatively warm, but the damp air and a breeze can make it seem much colder than the thermometer indicates. It is wise to have raingear available. Summers frequently do not start until July and come close to drought with day after day of near-perfect weather through at least early September. Hot spells are infrequent. The rugged, snow-capped peaks of the Olympic Mountains dominate the interior of the Olympic Peninsula, topped by 7,965-foot Mount Olympus. The mountains and the prevailing storm paths have created a rain-forest ecosystem on the west-facing slopes, with moderate temperatures, fog, and lots of rain—upwards of 200 inches per year. On the opposite side of the mountains, a rainshadow effect brings low rainfall to the area from Port Angeles to Port Townsend, which frequently enjoys blue sky on days when the rest of Western Washington is socked in. Dungeness, near Sequim on the North Olympic Coast, has just 15 inches of rainfall yearly. The South Coast has no high mountains to the east. Climate is similar to that of the Outer Olympic Coast, but rainfall is less abundant. The North Pacific Ocean at this latitude tends to have a covering of stratocumulus clouds. With prevailing airflow from the west this leads to a lot of foggy mornings with the fog burning off during the day. It also means that it may be drizzling in the lowlands but bright sunshine on Hurricane Ridge in Olympic National Park at an elevation of 5,200 feet. Heavy snows are infrequent except in the high Olympics where they can be a problem. A more regular winter problem is light snow, freezing rain, or frost making the roads very slippery in the morning, especially on the North Olympic Coast. Surface soils on the Olympic Peninsula are mainly composed of loose glacial debris. In exceptionally rainy years the earth slides in places, closing roads sometimes for long periods until repairs can be made. Large areas of subsidence may continue to move for months, but there is little danger of getting caught by a slide as it is usually more of a creep. Waterside bluff slides are more abrupt and do cause loss of life but present minimal danger to birders— the big ones mostly occur at night. 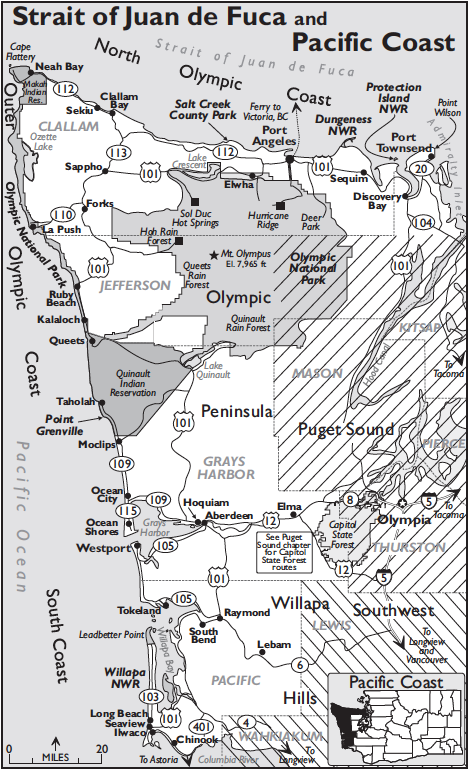 Information on road closures can be obtained by calling the Olympic National Park Visitor Center in Port Angeles (360-565-3130) or, for NF roads, the Pacific Ranger District Office in Forks (360-374-6522). For the western portion of the peninsula, also try the Visitor Information Center in Forks (360-374-2531), which has forest and park information and is open on weekends. (An America the Beautiful or Northwest Forest Pass is necessary to park at many trailheads.) Car prowls do occur, even near towns. It is prudent to lock valuables in your trunk. Campgrounds are numerous, but some are closed in the winter months and the most popular ones can be crowded during the short summer season. Restaurants, motels, gas stations, and other services are many and varied in larger communities such as Port Townsend, Sequim, Port Angeles, Forks, Ocean Shores, Hoquiam, Aberdeen, Westport, and the Long Beach-Seaview strip. Smaller communities also offer accommodations for travelers, although availability varies seasonally.